Birding very settled at Rainham from late Jan through mid Feb 2015. Wintering waders put on a good show with swirling Dunlin flocks joining the Lapwings and Golden Plovers throughout. Over 100 Redshanks roosting along the Thames with similar numbers of Black-tailed Godwits. The Ruff continues to winter at Coldharbour Point alongside Redshank and Snipe. Aveley Bay holds a dozen or so Ringed Plovers, and today an Avocet added variety. An increase in Little Egrets over the last few weeks and wintering duck remained, including double figures of Pintail. Displaying Teal and Shelduck squabbling mid Feb, as well as the first 'whinnying' Little Grebe. Raptors seen included Marsh Harriers, Buzzards, Kestrel and Peregrine. Marsh Harriers being especially impressive with a female seen chasing a Shoveler today and later seen flying high above the reserve surveying its patch. A week ago Peregrines were particularly active over the reserve with multiple sightings during that particular visit. All the 5 commoner Gulls throughout and today saw a cracking Caspian Gull (1st w) resting with similar aged Herring and GBB Gulls on the shore at low tide opposite the RSPB centre. Several colour-ringed BH Gulls (yellow) read in the field at Stone Barges proved to be of local origin. Ravens entertained most weekends and the one shown opposite was seen today looking out of place on a post in Wennington Marsh. It had just robbed an imm. GBB Gull of a scrap of food. Multiple pairs of Stonechats overwinter but did not see any today, Cetti's Warblers shout and Chiffchaffs call, and last week a Bullfinch 'piped' overhead. A Water Pipit showed west of Stone barges on the day of the February WeBS count. What's the birding highlight of the last few weeks? A choice between Caspian Gull, Ravens or Marsh Harriers? 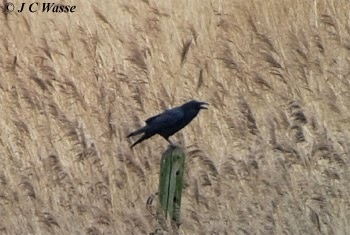 Whilst the Caspian Gull was stunning and the regular Ravens and ca. 10 Marsh Harriers in the area were perhaps unheard of just a few years ago, the birding highlight came from left field. 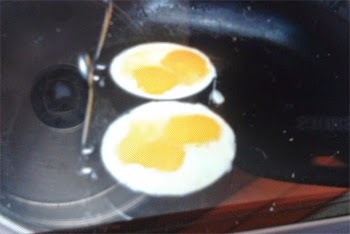 It was from breakfast today with the gang - which produced not one, not two, but five 'double-yolkers', two shown opposite.